Tuxedo cheesecake is the perfect dessert for any occasion. It can be dressed up or dressed down, and the delicious layers of chocolate, white chocolate, and cream cheese make tuxedo cheesecake a perennial favorite. The following recipe makes a classic tuxedo cheesecake. In a medium bowl, mix the crushed cookies and the margarine. Press the cookie and butter mixture evenly onto the bottom of an ungreased nine-inch spring form pan. Bake the crust for 10 minutes. Remove from the oven and set it aside. Melt the white chocolate chips over a double boiler until smooth, stirring frequently. Using a hand mixer, stand mixer, or food processor, combine the cream cheese, sugar, and vanilla extract. Beat or process the mixture until it is smooth. Beat in the eggs, one at a time, until the mixture is smooth. Gradually beat in the melted white chocolate chips until smooth. Spread the mixture over the chocolate cookie crust. Place cheesecake in the heated 350 degree oven and bake for 40 to 50 minutes. The cheesecake is done when the edges are set but the center of the cake still has slight movement to it. Remove the cheesecake from the oven and place on a wire rack until cooled. Chill in the refrigerator until it is firm. Once firm, carefully remove the sides of the spring form pan. Place the block of chocolate or white chocolate on a large piece of parchment paper. Using a melon baller or bench scraper, scrape down the bar of chocolate (away from you) to create chocolate and white chocolate curls. The melon baller will create curls, while the bench scraper will create shavings. Refrigerate the chocolate curls or shavings in a tightly sealed container until you are ready to use them. 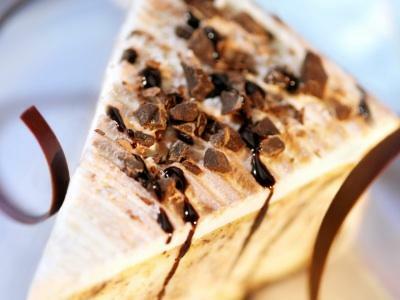 Garnish individual slices of the cheesecake with a combination of white and dark chocolate. You can make a number of variations on this delicious cheesecake. Most of the variations come from the garnish. Here are just a few. Melt the butter and toss with the pecans. Place pecans on a cookie sheet in a single layer. Toast in the oven for 10 to 15 minutes, tossing occasionally. Melt the caramels in a double boiler until smooth. Stir in the heavy cream until smooth. Pour warm caramel over the top of the cheesecake. Sprinkle with toasted chopped pecans. Combine all of the ingredients in a sauce pain and bring to a boil. Cool slightly and pass the sauce through a strainer or cheesecloth to remove the seeds. Cool completely before garnishing the cheesecake. To garnish cheesecake, swirl sauce on the plate around the cheesecake with a little bit on top. Finish off by topping the cheesecake with a few fresh raspberries. Bake your cheesecake in a water bath. To do this, place a pan that is larger than your cheesecake in the oven filled with hot water as the oven preheats. When it is time to bake the cheesecake, place it in the water bath. Over-baking is one of the leading causes of cracks. Remove the cheesecake from the oven while there is still a two to three inch wiggly spot in the middle of the cheesecake. Sometimes the sides of the spring form pan can pull on the cheesecake as it cools, causing cracks. To prevent this, you might try greasing your spring form pan and lightly loosening the sides as the cheesecake begins to cool.